In our survey of more than 1800 scientists we found that the large majority agree that recent climate change is predominantly human induced. The article where we discuss our results is publicly available and a brief rundown of the main conclusions is provided in this blogpost. The most recent survey of climate scientists said about 57 percent don’t agree with the idea that 95 percent of the change in the climate is caused by CO2. (…) There was a survey done of 1,800 scientists, and 57 percent said they don’t buy off on the idea that CO2 is the knob that’s turning the climate. There’s hundreds of reasons the climate’s changed. What did we actually find in our survey? In our survey of 1868 scientists studying various aspects of climate change, we asked two questions about the causes of recent global warming. Of all scientists who provided an estimate ~85% think that the influence of human greenhouse gases is dominant, i.e. responsible for more than half of the observed warming. ~15% think greenhouse gases are responsible for less than half of the observed warming. If you zoom in to those respondents with arguably more expertise, the percentage agreeing with human dominated warming becomes 90% or larger. 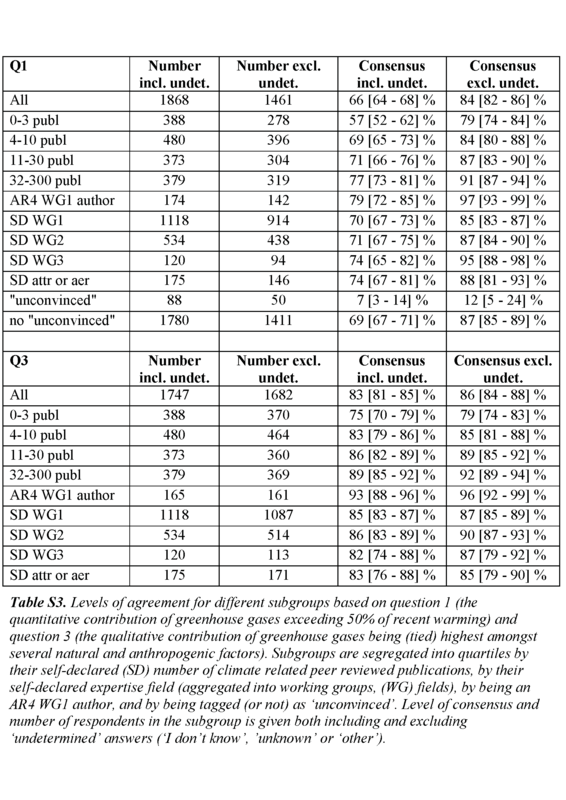 The existence of a strong scientific consensus about climate change is also clear from previous surveys of scientists and of the scientific literature and from statements of scientific societies. A scientific consensus is a logical consequence of the evidence for a certain position becoming stronger over time. 1) it is based on a wrong interpretation of just one of the two survey questions about the causes of recent climate change. 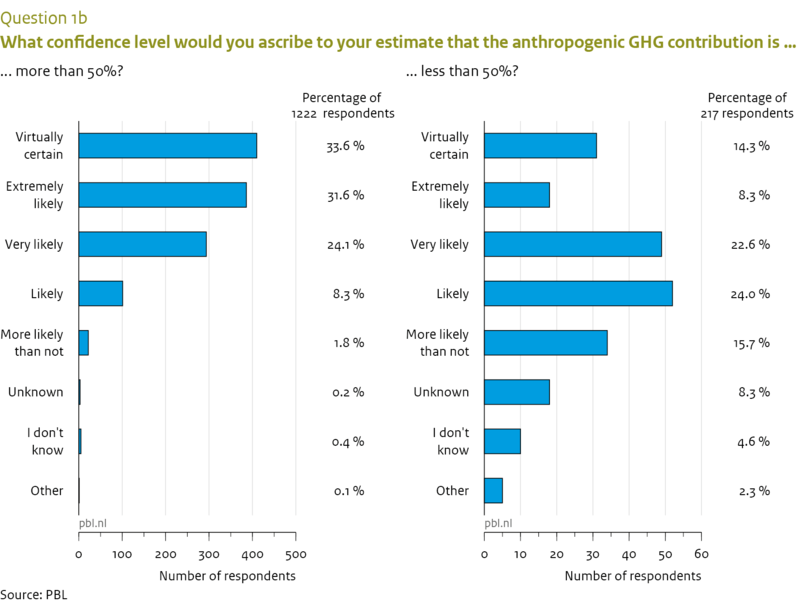 2) it is based on the argument that respondents who didn’t provide a specific estimate for the contribution of greenhouse gases (22% of the total number) think that this contribution is small. That is a wrong inference. 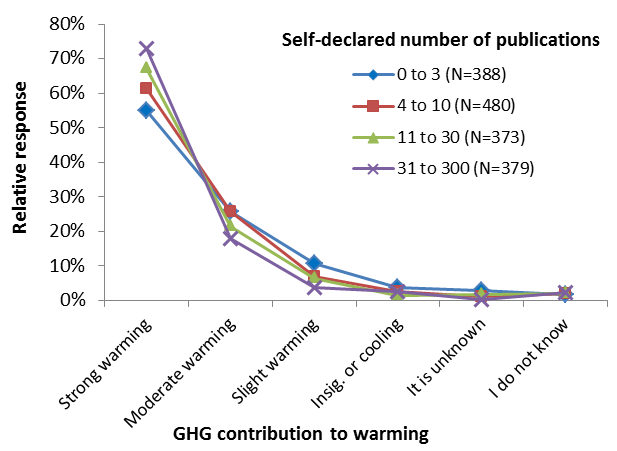 3) it is based on the argument that respondents who think it is “very likely” or “likely” or “more likely than not” that greenhouse gases are the dominant cause of recent warming disagree with this dominant influence. That is a wrong inference.